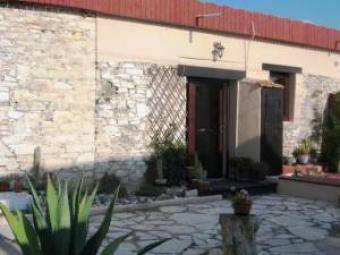 This property is a traditional village style home set in the heart of Asgata, which is located in a valley in the hills close to the village of Moni. It is 10 minutes drive from the Limassol Beach Hotels and a mere 15 mins drive to Governors Beach. Quaint cobbled lanes and other traditionally modernized village houses surround the house, which you the peace and quiet in a beautiful setting and has recently been renovated to a modern standard whilst still reflecting the old style building and has many original features. The village of Asgata is a warm friendly village and offers 2 Taverna`s/Restuarants, coffee shop, village bank, supermarket, paper shop, butchers and post office. It is the perfect retreat from the hustle and bustle of every day life and still remains within easy access to Limassol town. The property comprises of 3 separate buildings which overlook a large stone walled courtyard (15m x 7.5m) accessible via a wooden gate, which offers total privacy and is sun facing all day long. It has traditional cobbled stones and is full of mature plants and potted plants and a rustic Wooden Bench. The courtyard has a decked dining area, traditional original stone sink (with running water), 2 additional water taps (for hoses etc), a garden shed (with electrical points) and an outside cabinet for gas bottles and storage and a BBQ area. A timber decked roof top terrace (8m x 4.2m) has recently been added to the property for both relaxation and dining. There is also has a parking space at the front gate. The living/dining room (9m x 3.1m) has French patio doors leading out to the courtyard. The kitchen (4.7m x 3.1m) has its own separate entrance. It is well equipped with adequate storage and workspace with oven, hob and extractor and a space for washing machine, fridge freezer and tumble dryer. Both rooms have been styled out with stone effect ceramic flooring tiles and pine wood tongue and groove ceilings. The bathroom (3.1m x 2.0m) has a modern 3 piece white suite with an over bath shower and shower screen, extractor fan and ceramic tiled floor and walls. Bedrooms 1 & 2 are on the second floor in the oldest part of the property, which has recently been renovated, rewired and re-plastered inside and the outside walls re-done with Grafiada Plaster. They have the original tiled floors and both have been done to a high standard whilst still keeping traditional features. Room 1 is ( 4.7m x 3.4m), Room 2 (8.2m x 3.4m) is presently being used as a Lounge/Study. Half of this room (lounge area) has a wooden floor (which can be removed easily) on which a bed can be placed to make a truly outstanding feature. The other half of Room 2 is presently being used as a study/office and has 2 telephone sockets one for Internet. This room has outstanding views of the surrounding hills and the new roof top terrace, ideal for those who like to work with a view. It has an original old cornice feature on one wall and is a very bright an airy room in the summer months. Original wooden doors separate these 2 rooms. The 3rd bedroom is on the ground floor and is a separate building all together. It is 3.5m x 2.6m and has a wooden shutter window. This room has a sloped low roof and is very quaint. There is adequate room for a double bed, 2 bedside cabinets and a wardrobe. The property is fully double glazed, has ample electricity sockets in each room, telephone and TV Ariel sockets in all rooms and also has satellite TV in the lounge. There are presently 2 telephone lines to the house so one can be used for Internet access. Water heating is supplied at present by electric immersion but there is opportunity to upgrade this to solar panels. The property being of the old style building of days gone passed has very thick walls which affords it to be easily heated in the winter months and enables it to be cool in the summer months. The property has ample space for future expansion. Full Clear Title Deeds (in English & Greek) in the Owners Name are available. All together this is a very desirable property for couples, families or first time buyers!! Asking Price is � 199,500!! !